Get Creative- Our Chalkboard stickers are brilliant for presenting ideas, planning and brainstorming. Apply the blackboard sticker straight out of the pack or use your imagination and cut it into funky shapes with scissors. Better than Chalk Paint - Our Chalk Stickers transform the walls of any kitchen, bedroom, classroom, dorm, restaurant, or office into a blank page. An excellent low-cost and low-mess alternative to traditional blackboard paint. Brilliant for Kids- Every child should have a chalkboard growing up. Our Chalk wall stickers provide a compact and excellent medium for kids to learn, do homework and explore their imaginations. 1. Ensure you choose a smooth flat surface to apply the chalkboard sticker. 2. Remove the backing paper from one corner first, then place the corner in the desired position and press against the surface ensuring no air is trapped. 3. Gradually remove the backing paper whilst simultaneously pressing the chalk sticker to the wall with your other hand. This step can be accomplished more easily with two people. IMPORTANT - This Chalkboard Stickers work best on smooth and flat surfaces, DON'T apply to ROUGH and UNEVEN wall surface. Walls with wallpaper are not suitable. 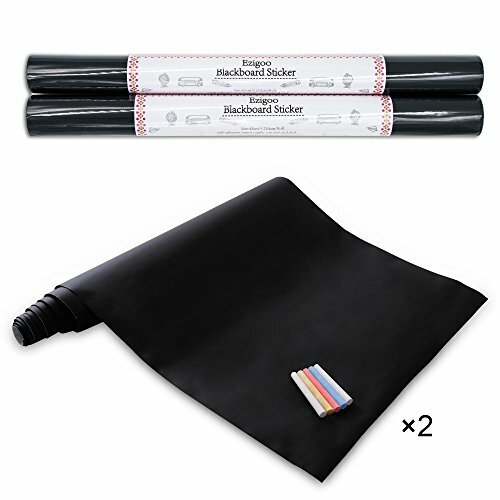 EZIGOO GUARANTEE - If you are not satisfied with your chalkboard stickers - for any reason - we have a 60-day money back guarantee! If you have any questions about this product by Ezigoo, contact us by completing and submitting the form below. If you are looking for a specif part number, please include it with your message.